After you login you will be on the view sites page. This page shows the sites you have defined and each site's last few logs. From here you can right click a site to edit it or click New Site from the menu to create a new one. 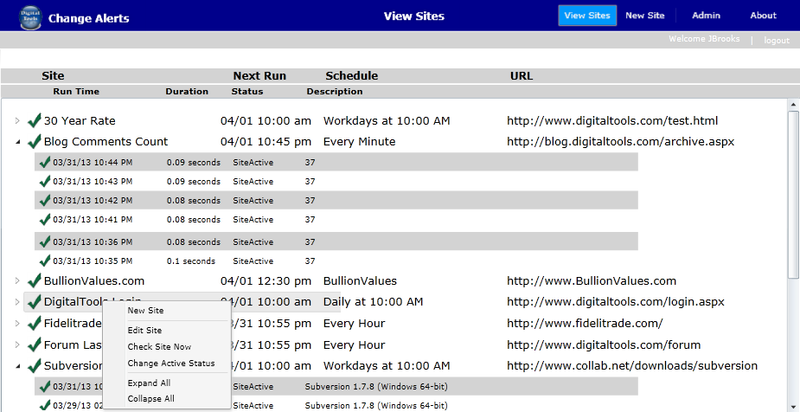 When adding or editing a site the first tab is where you give it a name and select a schedule. 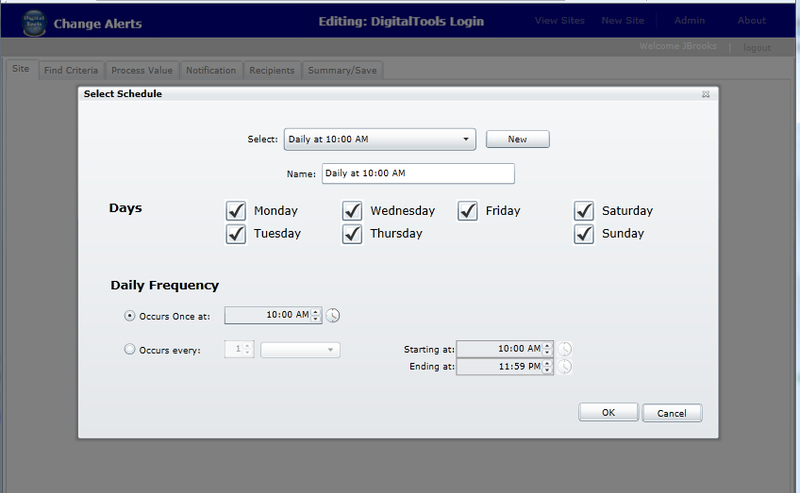 You can also add or edit schedules from the first tab by clicking the Edit button next to the schedule. 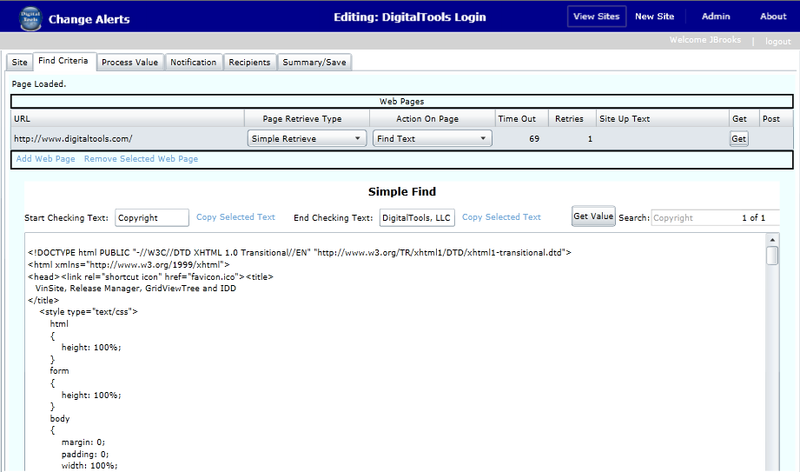 The Find Criteria tab is where you enter the URL of the target site and retrieve it by clicking the Get button. You then tell ChangeAlerts! how to find the value you are interested in on the page's source HTML by specifying the starting text to search for followed by the ending text. An example would be a page that contained the HTML text "<H2>The Current Version is: 1.0</H2>" you could have "Version is:" as the starting text to search for and "</H2>" as the ending text. So the text between the two would be the value that you are intereste in. You can click the Get Value button to test the value it finds. If your page requires a more complicated way of finding the value then use the Advanced Find option. From here you can also define more complicated processes involving posting data and multiple pages. See the online help for more details on these option. The default way to process the value once found on your target page is to just compare it to the value found the previous time ChangeAlerts! checked it. If your logic in processing the value is more complicated than a simple text compare then you can use the more powerful C-Sharp method. From within the application you edit a C-Sharp method. The New Value, Old Value and HTML Document are all available to your code. 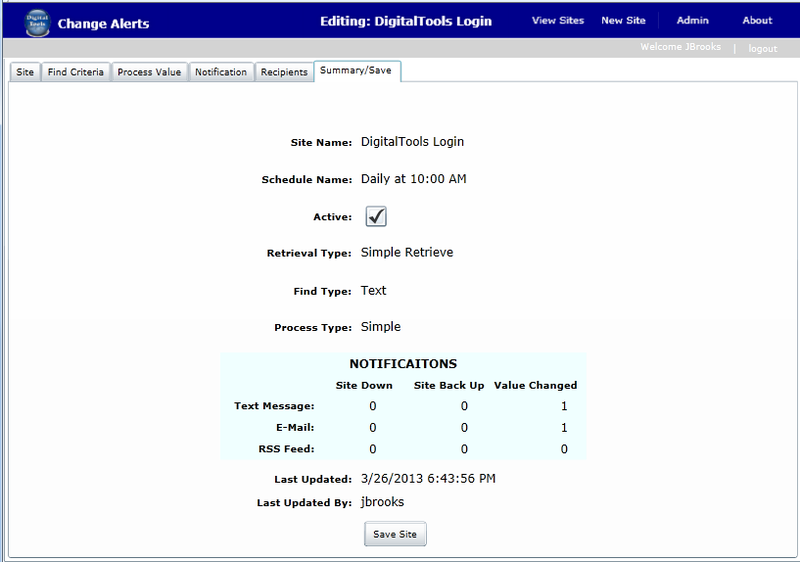 You can use your own logic and set all of the variables that control alerts, the content in alert message, etc. Futher you can reference and call your own assemblies. So you can work with your own classes, database, web services, etc. Online testing of your method is also available. See the online help for more details on this option. This tab allows you to enter notification addresses and then specify the events that trigger notifications. This is the tab where you review your data and then save it. Once saved, your schedule is in affect. You can select the View Sites option from the menu to return back to the first page. Copyright 2018 ©DigitalTools, LLC. All rights reserved.